COLORADO SPRINGS, Colo. — The 2018 USA Triathlon Age Group National Championships (sprint- and Olympic-distances) are currently on track to surpass 2017’s participation numbers, USA Triathlon announced on Monday. Registration totals to date are more than 65 percent higher than at the same point last year, as the event moves to Cleveland in August. With 34 weeks until race day, 1,193 participants are registered to take part in either the sprint or Olympic-distance race — compared to 807 at this time last year. Age Group Nationals will take place in Cleveland for the first time since 1992, and will be held from Aug. 11-12. On schedule for Saturday, Aug. 11, is the Olympic-distance race, which includes a 1,500-meter swim, 40-kilometer bike and 10-kilometer run. This event requires qualification to compete and features the nation’s top amateur athletes in each age group. To learn more about qualifying and participating in the Olympic-distance race at Age Group Nationals, click here. The sprint-distance race, set for Sunday, Aug. 12, covers a 750m swim, 20k bike and 5k run. Sprint-distance registration is now open at ACTIVE.com, and no qualification is required to compete. To learn more about the 2018 USA Triathlon Age Group National Championships, click here. Registration for the 2018 Duathlon National Championships is also tracking ahead of last year, outpacing the 2017 total by 64 percent at 16 weeks out. The event is headed to Greenville, South Carolina, for the first time, and will be held earlier in the year — April 7-8 — than the June timeframe of the past three years. Racing at Duathlon Nationals will include a draft-legal sprint-distance race (5k run, 18k bike, 2.85k run) on Saturday, April 7, and two non-drafting races at the standard distance (8.45k run, 39k bike, 4.5k run) and sprint distance (5k run, 18.2k bike, 2.85k run) on Sunday, April 8. For more information about Duathlon Nationals, click here. Both Age Group and Duathlon Nationals offer the opportunity for top finishers to qualify for Team USA to compete at the ITU Age Group World Championships. The 2018 ITU Age Group Triathlon World Championships are set for Sept. 13 (sprint-distance) and 16 (Olympic-distance) in Gold Coast, Australia, while the 2018 Sprint and Standard-Distance Duathlon World Championships will take place in Odense, Denmark, as part of the ITU Multisport World Championships Festival from July 4-6. To learn more about Team USA, comprised of the nation’s top amateur athletes who represent the U.S. at each ITU World Championship event, visit usatriathlon.org/teamusa. For all four of USA Triathlon’s owned National Championships — Collegiate Club, Duathlon, Youth & Junior and Age Group — registration will remain open until the week before the event or until the race sells out. 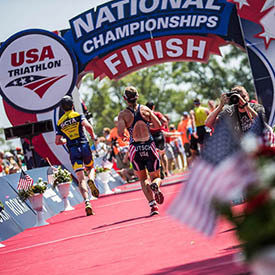 To view the complete 2018 USA Triathlon National Championships calendar, visit usatriathlon.org/nationalchampionships.